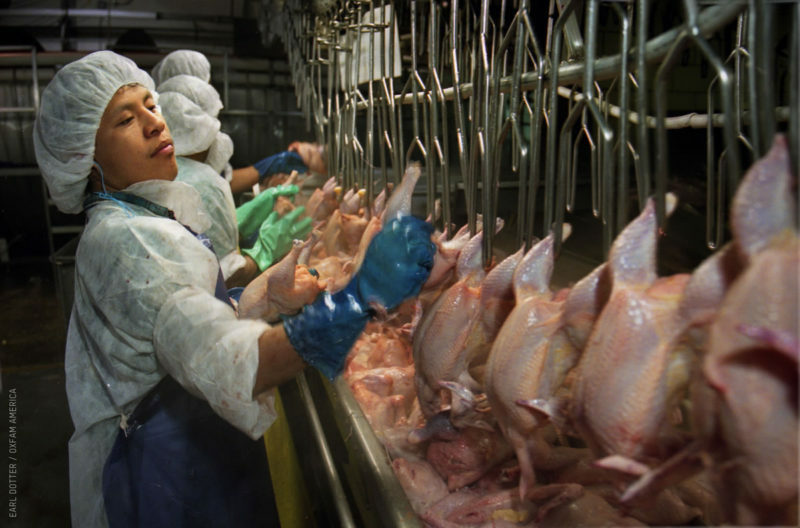 Workers in a chicken processing facility. Photo: Workday Minnesota/Earl Dotter, Oxfam America. 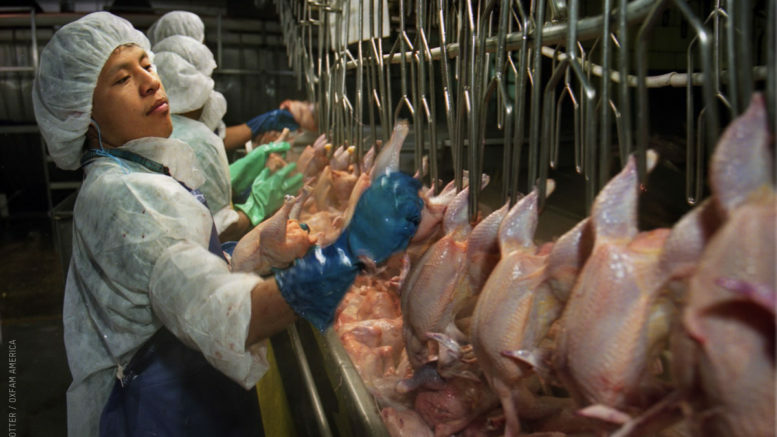 Last week, the Occupational Safety and Health Administration (OSHA) issued a landmark citation against a Pilgrim’s Pride chicken slaughterhouse and processing facility in Live Oaks, Florida. Among other serious violations, OSHA cited the company for failing to promptly refer injured workers to medical attention. Instead, the company, one of the largest chicken producers in the world, relied on in-house medical treatment. 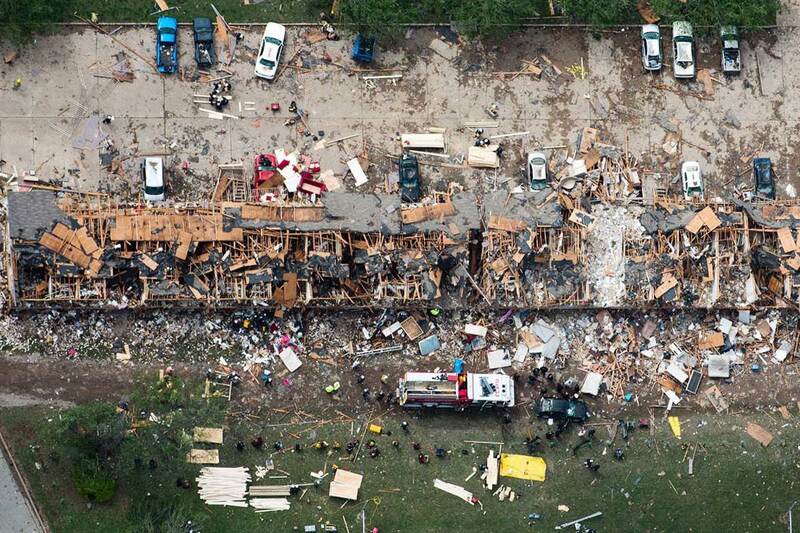 The citation marks the first time that OSHA has ever cited a company for such a violation. In efforts to keep worker compensation insurance rates low, companies routinely insist that injured workers first visit their in-house medical professionals. Many employers have rules requiring workers to first get approval before leaving work to seek medical attention; thus many workers who get hurt on the job do not seek help right away out of fear of being terminated. Employers worry that if workers get outside medical attention that they will report the injury and be encouraged to file worker compensation claims. By delaying the initial examination period, employers can claim in court that the injury did not occur at work and thus was not the employer’s responsibility. The results of delayed medical attention for workers injured on the job have often proved fatal. Last year, an investigation by Dave Jamieson of the Huffington Post found that Amazon warehouse contract workers employed by Integrity Staffing Solutions in Chester, Virginia were instructed not to call 911 if a worker got hurt on the job. Thus in January of 2013, a worker suffering a heart attack was left unconscious on the floor for nine minutes before the decision to call 911 was made. The landmark citation by OSHA could open the door to the agency issuing more citations to companies that refuse outside medical attention to those injured on the job. Earlier this year, OSHA demanded that workplace injury data begin to be published in an online database. This will enable what many workplace safety advocates suggest is a key part in preventing injuries on the job: drawing more attention to how commonly they occur. 1 Comment on "OSHA Issues Landmark Citation Against “Medical Mismanagement” in Northern Florida Poultry Plant"
On the railroad, managers have been guilty of following a worker to the hospital and getting involved with the medical process. Matter of fact, this is a common practice. Railroaders were cut into OSHA whistleblower protection under the FRSA of 2009. For railroad companies, hiding injuries are a big deal because the Federal Railroad Administration tracks the information, and railroad companies reduce bonus payments on managers if injuries occur. The threat of fines from the FRA and the reduction of Bonus payments has created a toxic situation that places managers in a very bad position. Workers fear being retaliated against for reporting injuries… I feel for these workers at the chicken plant… railroaders are protected by the Federal Employers Liability Act.. the chicken workers are not.